Baku, an organizer of the best and highly prestigious sporting events, saw off another world-significant competition -- FIG World Cup in Trampoline Gymnastics and Tumbling on February 19. Azerbaijan Gymnastics Federation launches the competitions’ season with the FIG World Cups welcoming 85 Trampoline and Tumbling gymnasts from 15 countries at the world-admired National Gymnastics Arena. Minister of Youth and Sports Azad Rahimov addressing the opening ceremony, said that FIG World Cup in Trampoline Gymnastics and Tumbling in Baku will play an important role in the development and promotion of these gymnastics disciplines in Azerbaijan. In the contemporary world, Azerbaijan is internationally recognized as a sports country, the minister said, adding that such a progress of sports in the country is also in the spotlight of the international community. The organization of international competitions according to secure and fair principles once more proves that there are no bounds in sport and it has vast geography, he added. “This is the very fact due to which our country has also been entrusted to host such prestigious events as the IV Islamic Solidarity Games, the FIG Trampoline Gymnastics and Tumbling World Cup in 2017,” Azerbaijani minister said. Trampoline gymnastics and tumbling is favourite sports discipline that attracts the large audience in the world, including Azerbaijan, he noted. The World Cup in Trampoline Gymnastics, that began developing in Azerbaijan since late 2013, is held in the country for the second time, while Azerbaijan is hosting tumbling events for the first time, Rahimov added. “I would like to thank the leadership of the International Federation of Gymnastics for its facilitation to the organization of such prestigious events in our country,” he said, adding that these competitions with participation of athletes from 15 countries of the world will create favorable conditions for the athletes to gain experience. Then a colorful opening ceremony was held by presenting a variety of gymnastic disciplines. During the two-day breathtaking competition, the athletes showed their skills and competed for the best title. To make the scene more expressive, the organizers used unusual lighting of the hall, forced the fans to focus only on the athletes, watching their stunning skills on the trampoline and the tumbling track and keep an eye out. This was done for the first time in the history of the World Cup. Azerbaijani gymnasts performed well and pleased the fans both at trampoline and tumbling gymnastics. Three silver medals won by Ilya Grishunin in men’s individual trampoline, Svetlana Makshtareva and Veronica Zemlenaya in synchronized trampoline and homegrown tumbling gymnasts Mikhail Malkin showed that three years and a lot of effort spent on the development of this type of gymnastics, were not in vain. The leader of the medal standings was the Russian team, who won six medals including four gold. 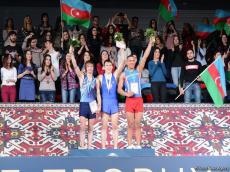 Commenting on the results of the competitions AGF Secretary General Farid Gayibov said that Azerbaijan did not set the goal to win medals, as these kinds of gymnastics began to develop in the county recently. "Our goal was to popularize the sport, in particular, as the trampoline is an Olympic sport. The results pleased us. Last year, when we held the first World Cup on the trampoline, we did not have any medals, but this year we won three medals. It shows that for the year we do not stand still. We did a great job. These medals are an indication of the work that has been done by coaching staff, as well as the Federation and the gymnast themselves," Gayibov said.